When Wade and Lisa Port decided to start performing as a duo in 2005, they were dating in Atlanta. In 2010 living in Sun Valley, Wade and Lisa, now married, are the core members of the band FourStroke Bus, which completed its first album, "Glad To Go." "Glad To Go" was recorded in Sun Valley at ENSO Audio & Design studios, owned and operated by the band's drummer, Cory Ballentine. Lisa plays guitar and sings and Wade plays guitar and mandolin and also sings. The locally produced album is the culmination of the efforts of an array of band members who have participated in the artistic growth of FourStroke Bus, which plays across musical genres to include blues, gospel, rock 'n' roll and funk. Band members also include Ken Martin and Chris Clark. Martin, a member of The Heaters, is also an avid guitar collector, which was an incredible addition to recording "Glad To Go." Martin's collection, which includes a 12-string Rickenbacker, added a variety of sounds to the recording. Clark performed on bass and other instruments until he went to college this fall. Mandolinist and valley musician Chip Booth sat in to record on the album, as did Rhonda Bradetich, a Sun Valley Summer Symphony flute player from the San Francisco Symphony. "There is a magnetism with our personalities and the songwriting on the album," Ballentine said. Recorded in a home studio, "Glad To Go" is the first CD Ballentine has recorded in Sun Valley, though he's been a recording professional for more than 12 years. His dream is to have a larger facility that will become the valley's premier audio and music production facility. "As artists we are so blessed to have a cutting-edge studio, especially in Sun Valley," Wade said. "It saved us time and money." FourStroke Bus has been playing throughout the Wood River Valley and this year reached a peak, performing at the Northern Rockies Folk Festival and the Sawtooth Music Festival. "We've covered so much ground," Wade said. "It was easy because everyone in the band loves to play together." 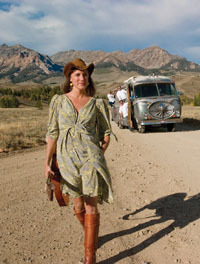 All 12 original songs recorded on "Glad To Go" communicate living in Sun Valley and personal life experiences. Lisa Port wrote "It's Your Life" about her mother, who was dying. "She could not get through it the first couple of times she played it," Wade said. Other songs such as "Green Grass Syndrome" is about Pioneer Cabin, inspired by Jamie Truppi, whose wedding Wade officiated at Pioneer Cabin. In addition, "Slow Train" is about seasons changing, timely for the record release party. All the songs on the album are unique, revealing the band's wide range of talent and abilities to cover many musical genres. The CD is also for sale on iTunes and CDBaby.com. For details, visit www.fourstrokebus.com. FourStroke Bus' "Glad To Go" CD release party will take place at Elkhorn Springs Restaurant in Sun Valley on Friday, Oct. 22, at 7 p.m. The kid-friendly party is free and will have a cash bar. The band will play at 8 p.m. CDs will be available for purchase.